The Revierderby, Germany’s biggest neighbourhood head-to-head. 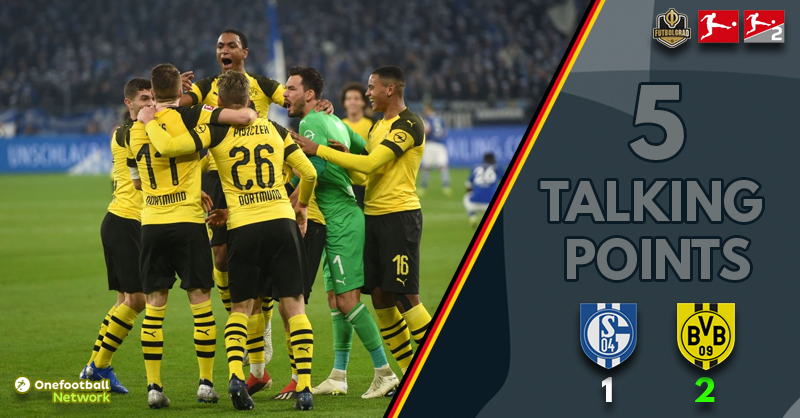 It rarely disappoints and the latest instalment of Schalke vs Borussia Dortmund continued that trend as the visitors class eventually shone through in what was, a thrilling encounter in Gelsenkirchen. From the very first whistle, this game had the feel of a big derby. 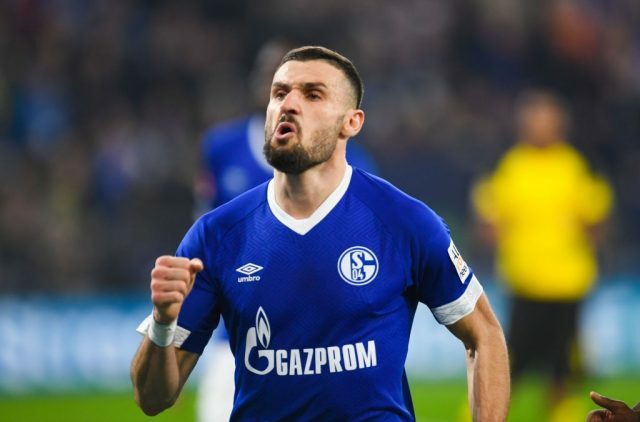 Last season Schalke claimed the high ground with a dramatic four-four draw in the Westfalenstadion, while running out two-nil winners at home in Gelsenkirchen. This campaign the status quo looks to have been restored in the Rhur valley. Dortmund are seemingly cruising at the top of the Bundesliga, with Schalke quite some way behind – could the Königsblau make up ground on their neighbours with an unlikely victory? The home side showed their guests that they were ready to fight, the tempo was electric as Schalke looked to test Dortmund from the off. It was though, their defensive frailties that once again became their downfall. With the game finely balanced, Marco Reus whipped in a free kick from just outside the Schalke box on six minutes – unfortunately for the Royal Blues, their marking was somewhere between absent and dire. Thomas Delaney needed no invitation to rise high and power his header into the bottom left hand corner of the net – sending those decked in yellow and black wild in the corner of the stadium that was all Dortmund. Schalke were rocked by their visitor’s goal, they needed almost thirty minutes to regain their composure. They did though, not give up the fight. Opting to take the game to Dortmund despite the early set back. Since his move from Werder Bremen in the summer, the 27-year-old has become an integral cog in the system that Lucien Favre has built at Dortmund. His partnership with Axel Witsel allows both players to reach their full potential – in almost every game played together. The central midfielder put in an assured performance in the Veltins-Arena. Possibly his best in a Dortmund shirt so far. Not only did he have the foresight to latch onto Reus’ cross to score the first goal, he also dominated the central area. He controlled the middle third of the field, an important area in any derby match. Completing 20 out of 24 passes in just this area alone. Short, long – forwards or backwards, Delaney was able to deliver the correct ball time and time again. As with any derby, emotions always run high – but for Schalke this detracted from their opening half. The way they took to the pitch, it was evident they had a burning desire to show Dortmund they meant business. However, it was an out of control Schalke – that at times looked like a side walking a tight rope of discipline. Bastian Oczipka was the first to be booked as he lunged at Jadon Sancho in an area where the Englishman posed no threat. Then, Salif Sane picked up a needless yellow card for dissent – arguing with the referee after a free kick had been awarded in his favour. It heaped an added pressure on the centre back’s shoulders for an hour. It wasn’t just those in blue who wobbled, after conceding a debatable penalty Dortmund then had their share of petulance. Achraf Hakimi and then captain Reus, both picked up a caution inside four minutes of each other. At one point it looked like 11 vs 11 would be short lived, referee – Daniel Siebert teetered on the edge of losing control as the tackles began to fly in. Both clubs eventually regained their composure as this Revierderby began to come under Dortmund’s full control. Last season, and possibly even the one before, Dortmund struggled when the game slipped out of their grasp. This time there was to be no repeat, especially in this fiercest of fixtures. Daniel Caligiuri equalised via an exceptionally continuous VAR decision. Reus adjudged to have impeded Amine Harit by standing on the Schalke player’s foot. Replays showed the Dortmund captain had caught his boot – but VAR is only to be used to “correct clear errors and for missed serious incidents”. The argument by those in yellow and black was Harit had no control of the ball as Reus used his body strength to legally roll the Schalke player off the ball. In real time there was no penalty – only the slow motion replay, that left more confusion for those watching on. The league leaders did lose their cool momentarily, but Favre screamed at them to remain calm – and so they did. Working the ball through the Schalke lines they eventually got the breakthrough their play deserved. Jadon Sancho started and finished a move down the Dortmund left that ensured the visitors would register their first win over the old enemy in three years. Once again it was the English teenager that had the final say in a pulsating fixture. With commentators fast running out of superlatives in which to describe the winger, he showed composure beyond his years to settle this giant of a fixture. For a change, the ex-Manchester City academy graduate had been having a quiet game. Seeing plenty of the ball, it was Schalke’s out of possession shape that denied the speedy threat the space he needs to thrive. In his only real chance of the second half, Sancho showed why the watching Schwarzgelben have taken him to their hearts. 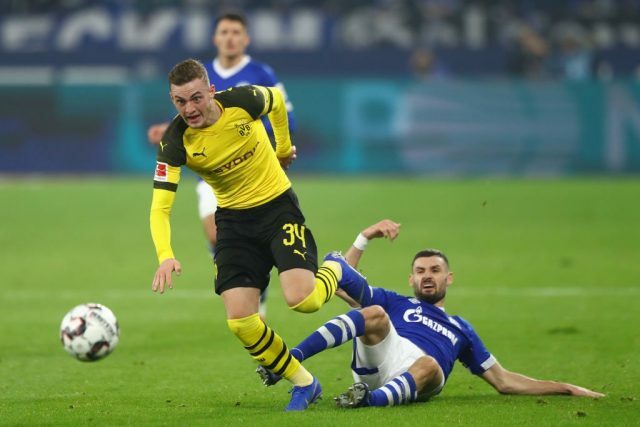 Playing a one-two with Raphael Guerreiro, Sancho found himself driving towards Ralf Fährmann, the 18-year-old calmly picked out the far corner of the net – the Schalke ‘keeper was left to watch as the winning goal slid past him. After the match an emotional Sancho explained why he looked so shocked and overcome to score the winning goal.